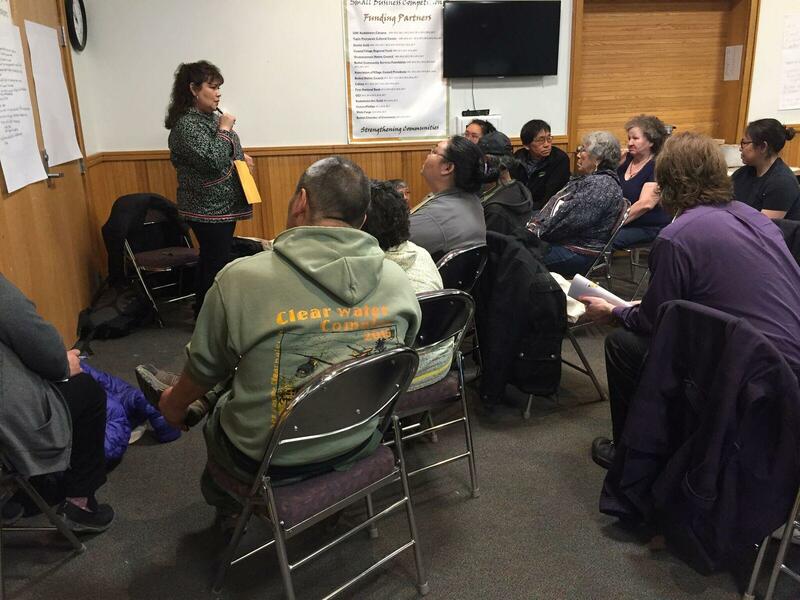 The Yukon-Kuskokwim Health Corporation met for their annual Tribal Unity Gathering at the Bethel Cultural Center two weeks ago. The group pictured here is discussing meeting Healthy People goals in their tribal communities. Mitchell Forbes: This year, on day two of the tribal gathering, we had a fairly focused and facilitated conversation with each of our service units about our Healthy People Napartet Strategy. So we had a conversation with all of our tribes that were in attendance on how we can meet those healthy people goals. Those goals are improving the oral health of our children in the region, reducing drownings, reducing unintentional injuries, and increasing suicide prevention. A lot of those things YKHC plays a role in, but our tribes also play a role in. I think it was very beneficial for YKHC to have that conversation. In years past we’ve just asked our tribes to set priorities, but this year we said, "how can YKHC work with your tribe to meet these healthy people goals?" I think it was a very beneficial conversation because we have a lot of issues that are impacting our villages and our tribes that are preventing our people from being the healthiest people they can be. Christine Trudeau: What kind of issues? MF: Oral health. The children in our region, so many children grow up drinking Kool-Aid, and Tang, and pop right out of the bottle, or early on. Obviously that amount of sugar, even ignoring the problems with their teeth, that amount of sugar in terms of setting up a child for childhood diabetes and things like that is concerning. But that amount of sugar really effects a child’s teeth, and can have some long-term damage and effects on a child’s general oral health, and can set them up to have a mouth full of fillings or their mouth will hurt all the time. It’s not uncommon for kids in primary school to just always have toothaches and things like that. That was one of the cornerstones of our conversations on the second day of the tribal gathering was how can YKHC equip our villages with the resources they need, whether that be more oral health education, more toothbrushes, things like that, and what role can the tribes play in helping get the word out to parents that they shouldn’t be feeding their child Tang, Kool-Aid, or even fruit juice in a bottle. Kids should be drinking milk and water primarily. All of our villages live primarily near some body of water, whether it be on the coast or along the river; drownings are a big issue for us. I don’t have the number off the top of my head, but typically in the Delta we lose a few people each year to drownings. So much of our lives in the Delta revolves around water. We really need to be looking at how the Delta can be better equipped to reduce those drownings. Part of that is making sure communities have life jackets and things like that, but part of it is also the education, awareness, and behavioral changes of not driving a boat while intoxicated, or not getting a boat with someone who is intoxicated. Things like that and how we can reduce those potential injuries and deaths that come from drowning and other water-related accidents. Finally, the other big one is suicide. Suicide is a difficult topic for many folks to talk about, but unfortunately is something the Delta has had to see the last several years. YKHC has behavioral health counseling and behavioral health resources. A big part of the discussion that we saw on day two was how we can get people to access those resources, how we can maybe remove the stigma from talking to a mental health professional or behavioral health aide, and how we can remove those barriers to accessing resources. Because suicide is a life threatening injury that can be completely prevented, and so obviously YKHC wants to see how our tribes can work with us to increase suicide prevention and bring the number of suicides happening in the Delta to a zero, is what we’d like. CT: In the discussion of any of those issues, did any feedback from the tribes that were represented there go in the way towards solutions that you wanted to share? MF: Not at this point. We had each of our service units, we had 11 service units, break out in small group discussion, and they reported back out to the general assembly, if you will, and they shared ideas then. But our senior leadership is going to meet next week to look at some of the solutions that were reported out and decided. Which of those solutions are feasible and actionable items that YKHC can put forth to our tribes and begin work on. We’ll have a better idea of what solutions we decide to pursue after next week. CT: How many communities were represented? MF: We had 65 delegates registered, and we had a few no shows, and each tribe are welcome to send two delegates, so we had probably around 25 to 35 tribes represented, I would say.